Nothing says Easter like dyed eggs. As a kid, I made a ton. One for each member of the family. I was so excited every year to choose the Easter egg coloring kit I would be using. Some years, glitter was involved. Some years, I did the old stand-by, with a white crayon and a cup of dye. Some years, I used those little shrink wrappers that snugly wrapped itself around the egg when you put it in hot water. Those were hardest to find in stores. Now, I leave the Easter egg dying to the little kids. 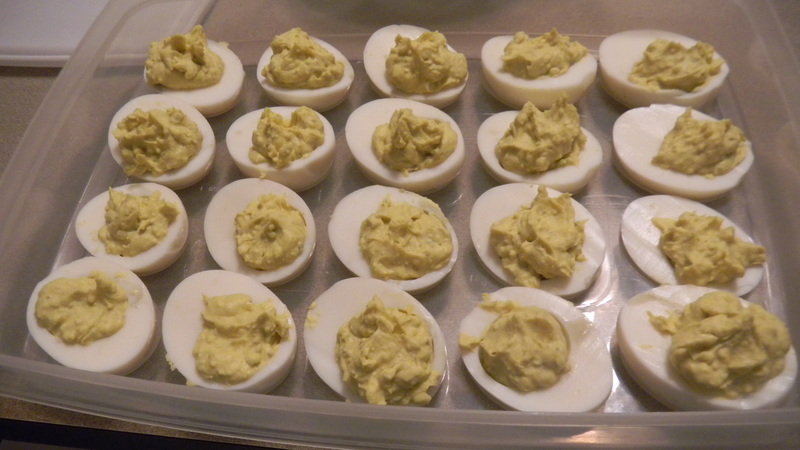 I do keep the egg tradition alive by making the deviled eggs for my family’s Easter meal. It’s super simple. And my mother-in-law taught me how to make them. Start by boiling eggs. I usually make a dozen at a time, giving me 24 deviled eggs. 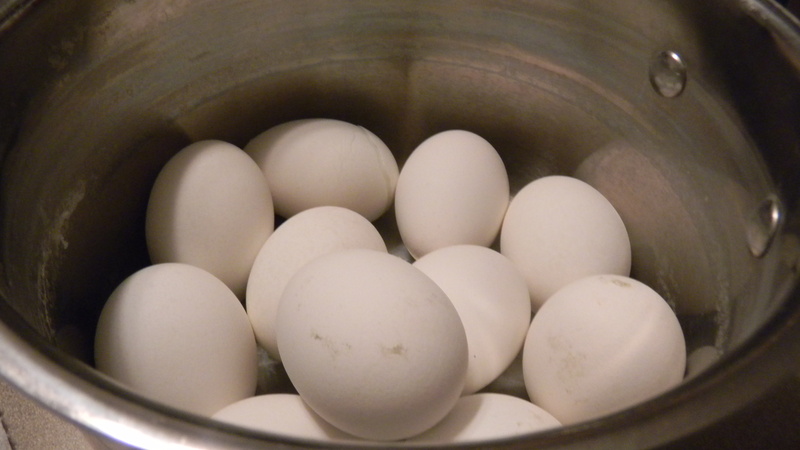 Once the eggs are hard boiled, let them sit in the water until it cools down. They will be easier to handle when they aren’t scalding hot, and I’ve found that letting them cool gradually seems to make the eggs easier to peel. 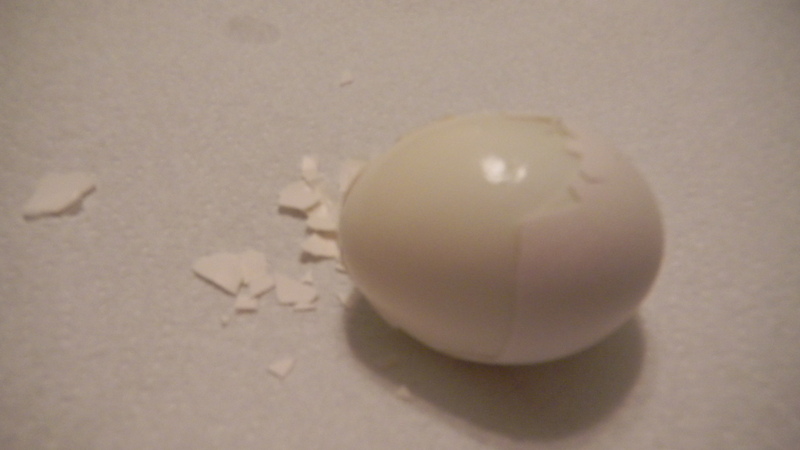 When the eggs are cooler to the touch, begin peeling them, being careful not to break the egg white. Once you’ve peeled them all, give them a rinse to be sure to get rid of all the shell. 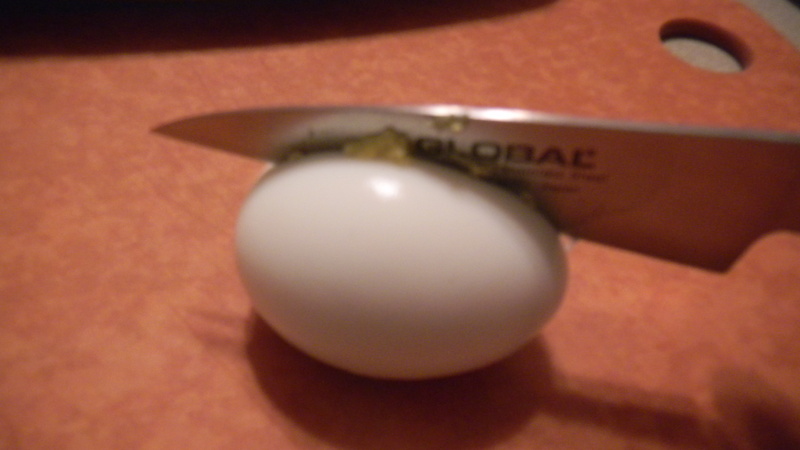 Next, cut each egg in half length-wise. 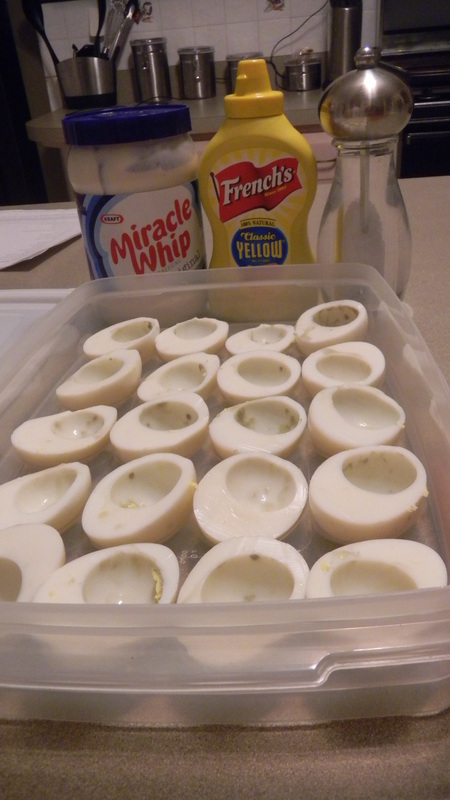 Scoop out the yolks with a spoon, set the egg white aside for later, and put all the yolks together in a bowl. Mash the yolks with a fork until they get to be the consistency of a fine dust. Add Miracle Whip (or mayonnaise), mustard, and salt. Stir to combine. This step is kind of difficult, because I usually don’t measure what I’m putting in. I do it by taste. If I had to make a guess, it would be about 1/4 cup of the Miracle Whip, 2 teaspoons of regular mustard (not Dijon) and 1/2 teaspoon of salt. After I stir everything together, I taste the mixture. Sometimes I need to put more of one of the ingredients in. 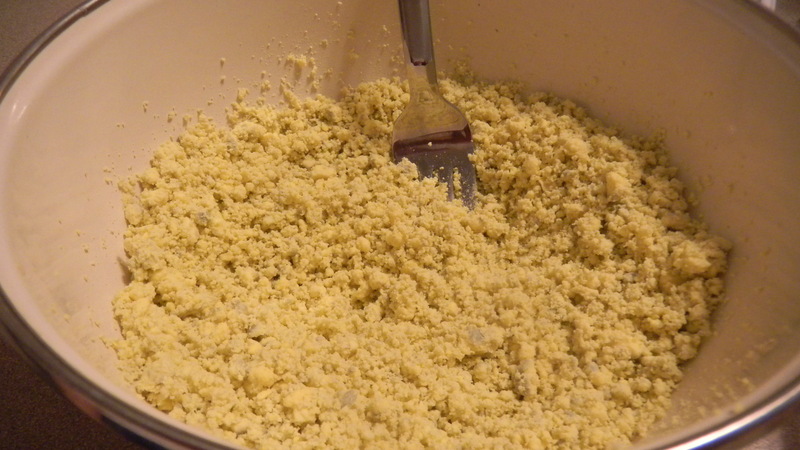 Once the egg yolk mixture tastes how you want it, begin spooning it into the egg whites. Overfill them because remember, you added ingredients to the yolks, so you should have plenty of the mixture. Top with a sprinkling of paprika. 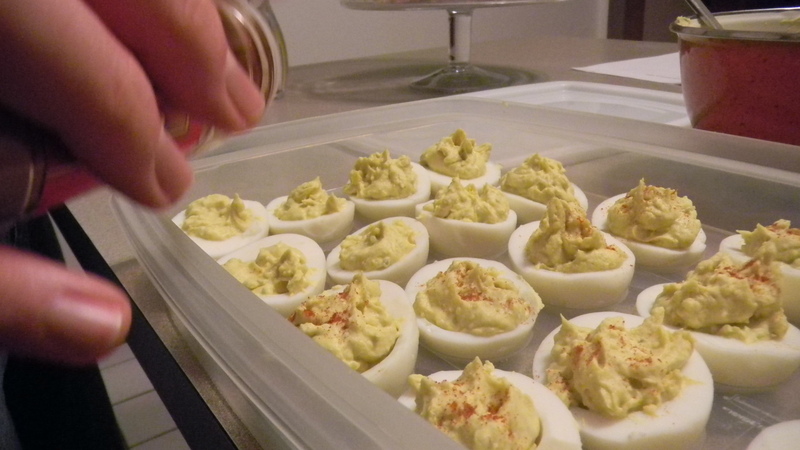 Keep refrigerated until the deviled eggs are served. These can be made as early as the night before, if you’re in a time crunch. 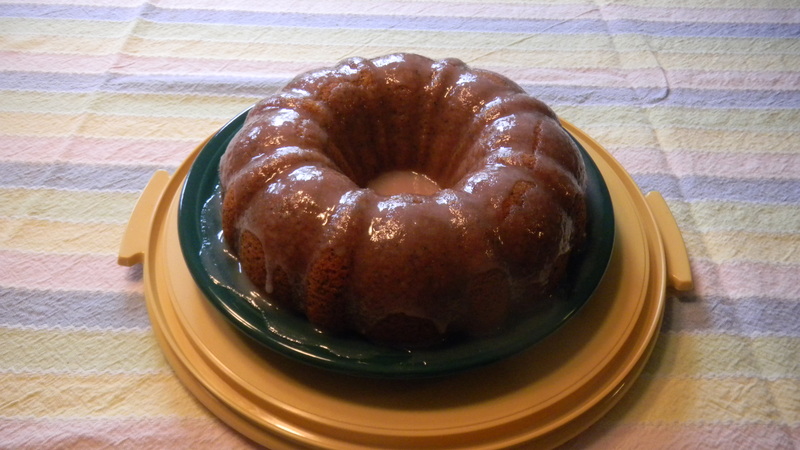 I also made this Poppy Seed Cake with Blueberry Glaze from Joy the Baker. She gives great step by step directions if you’re interested. Here’s what mine looked like on the family’s Easter dessert table. My glaze wasn’t quite as blueberry as Joy’s was. I think it was because the recipe calls for thawed frozen blueberries and I used fresh blueberries instead. Mine was still quite tasty though. Also, fun fact for you. As I was getting ready to make the glaze (at 11pm) which calls for 1 1/2 cups of powdered sugar Dan realized there was no powdered sugar in the house. Not wanting to go to the 24 hour Jewel, Dan googled “making powdered sugar from granulated sugar” to see if it was possible. He told me he saw this in a late night Magic Bullet infomercial. Lo and behold, it works! We measured 1 1/2 cups of regular sugar, put it in our blender on high and voila – powdered sugar! 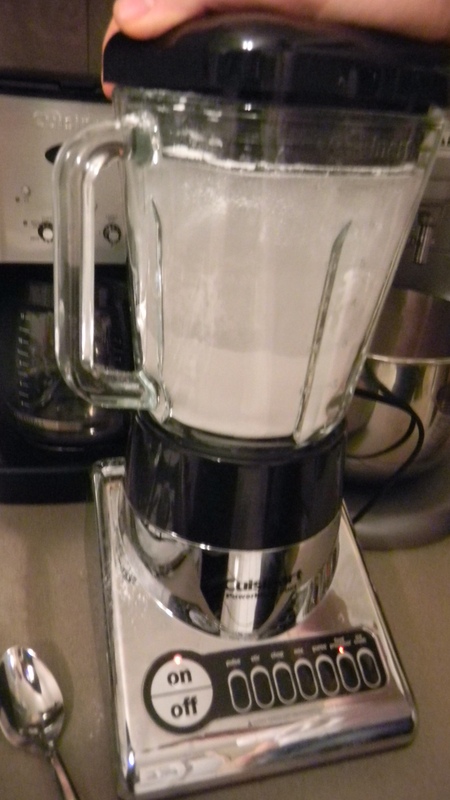 Here’s a photo of the blender in action. Hope you had a fantastic Easter!